It’s always nice to have convenience products made especially for vegans. Yes, they may be a processed foods, but in those moments when you just don’t have the time to cook certain things from scratch, these products certainly help out. I recently ordered some goodies from Vegan Essentials and decided to throw Chreesy Mashed Potatoes in. This product is easy to prepare: add the powder to a pot with some liquid, cook, then add some soymilk and buttery spread. The final product, in my opinion, wasn’t that great. I thought the texture was too mushy and the flavor could have used some more spices. I think the best application for these potatoes would be in a casserole or shepherd’s pie type dish and not as a solitary side. I did set aside half the product to prepare a recipe described on the box: Croquettes. Just like the basic product preparation, this recipe was easy to prepare: shape cooked mashed potatoes into patties, coat in panko bread crumbs, and pan fry in a little bit of oil. This method of preparation made it taste so much better. The panko added the bit of texture I was missing with the original potatoes. This would make a better side dish than the basic mashed potatoes. I’m not sure where they sell this product in stores, but it is still being offered by Vegan Essentials. Many months ago, I bought this deal for three mushroom growing kits by Back to the Roots. I thought this was such an awesome thing! I can grow my own mushrooms?! I love mushrooms. Plus, oyster mushrooms were expensive and hard to find in the stores. I thought I’d save a bundle. The thing is, you have to spray the thing with water twice a day, everyday, until you are ready to harvest. Since I’m gone most weekends, this kit ended up being quite a burden. When I finally found a good time to start growing, I did as directed. First, you have to soak the kit (instructions are included when you buy the kit). Then you drain it, put it back in the box, cut some slits, and wait for things to grow. I say “if” you kit grows, because my first kit did not grow. They have a 100% guarantee, so I contacted them for support. It took a few days for them to respond (a lot of time wasted for a kit that should be harvestable in about 10 days). By the time they did reply to me, I had already given up on that kit and started a new one (seen above). They gave me tips on how to save the first kit, but it never did grow, so they sent me a new one. They also say that “when you are ready” you can go ahead and follow the same steps to harvest the other side of the kit. Cool – I can get two harvests out of one kit! Well, I wasn’t “ready” to harvest the second side immediately after finishing the first side, so I waited a week or two. That was a mistake. I came into my kitchen one day to see my kit covered in mold (the bad kind) and fruit flies swarming the place. I had to take that kit out to the trash – leaving me with only one harvest under my belt. So, would I buy this again? Definitely not!! I think I bought it for around $13, but I’ve seen oyster mushrooms being sold at Whole Foods for $10-$15 a pound. Considering I only got 3 and 1/8th ounces out of my one harvest, it was way not worth the money. I’d say this is only worth it if you have kids and want to do something fun with them. Save your mushroom purchases for the stores. And did they taste good? I actually didn’t see much difference in them compared to some varieties of cheaper mushrooms at the store. I had been wanting to try this Clam Chowder recipe from Healthy Happy Life, so I used the mushrooms for that. The soup was great!! But I think you could easily sub the mediocre Back to the Roots mushrooms for another variety. I went to Follow Your Heart, because it’s one of the few places to get a vegan breakfast. I love this place, not only because of their varied menu, but also because they have a wonderful market with hard to find vegan products. My breakfast meal was the cleverly titled Om Lette ($10.25): an omelette shaped tofu pancake with your choice of three fillings and cheese. I chose to have my omelette filled with mushrooms, spinach, and avocado. It also came with a side of hash browns and fruit. I loved this dish, although I thought it had a bit too much cheese. It’s nice to be able to get a vegan omelette, though. Real Food Daily used to have one at their Sunday brunch, but it is no longer on the menu (bummer). I also shopped around the market and found some vegan goodies I haven’t bought before. I haven’t used the Tofutti Ricotta ($5.79) yet, but now you know where to get it. Since purchasing this Ricotta, though, I have heard it’s not that great. Have any of you tried it? Follow Your Heart now carries Upton’s Naturals ($4.89) for those of you looking to try some new seitan varieties. I used this to put into a beans and rice dish from the cookbook “Vegan Yum Yum” and it was delicious. Amanda’s Bakery has their cupcakes here and you can get them in the refrigerated section in packs of four. I got the Maple Cupcake and Raspberry Chocolate Cupcake. Both were really good. And even though I don’t know how long they had been sitting there, they still tasted pretty fresh. 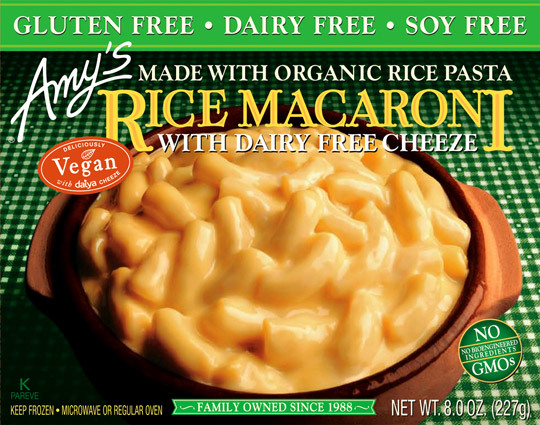 And they have a new prepared Vegan Mac and Cheese from Daniel’s Choice. I thought this was very creamy and a good sized quantity. It did have this one flavor. It reminded me of when I was a child and I would eat the boxed mac and cheese at friends’ houses and sometimes they would add chopped hot dogs to it (something I did not enjoy). Even though I would pick the hot dogs out, it still had that hot dog taste. I’m guessing this smokey taste came from the roasted peppers listed in the ingredients. I’m weird, I know, and this is probably my personal little quirk, but that flavor just bothered the little child inside me. Otherwise, it was very tasty. Follow Your Heart’s market has tons of other products on their shelves. There’s always something new to discover. If you haven’t been there yet, you’re missing out.